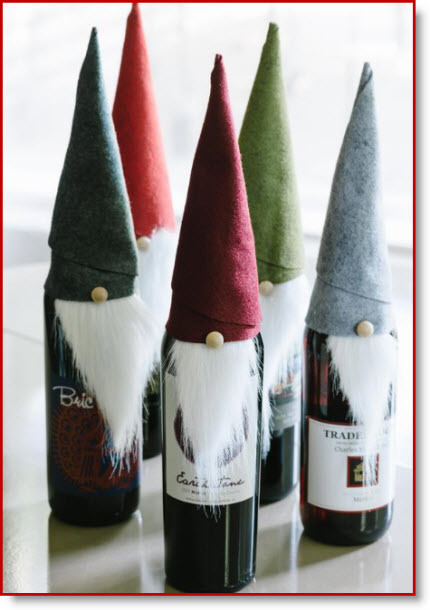 This is the first of its kind I have seen; too cute from HGTV 🙂 Before you bring a bare bottle of wine to your next holiday soiree, dress it up like an elf. First cut felt into an eight-inch-by-10-inch rectangle, and then fold into a conical shape. Fasten the folds tightly with a dab of fabric glue along the bottom. Next, cut faux fur into a triangle shape approximately four inches long by two inches wide, then attach along the inside edge of the felt cone. Add a pompom along the edge of the felt cone, and then slip onto the wine bottle. P.S. you could use fluffy white yarn or white roving for the beard. What a brilliant idea for wrapping a gift bottle! Love it, too, but how do you shape a rectangular piece of felt into a cone????? I have tried and tried and tried without success. You are right. You will need to make it a square. I started with a felt rectangle that was 9″X12″. I cut off to make a square 9″X9″. Then I googled cone hat for elves and saw how to round off the lower edge of the hat. They really are cute, especially in a grouping. Hope that helps! Hi – equally confused about the rounding of rectangle/square – can you share the website tutorial to making the cone shape?